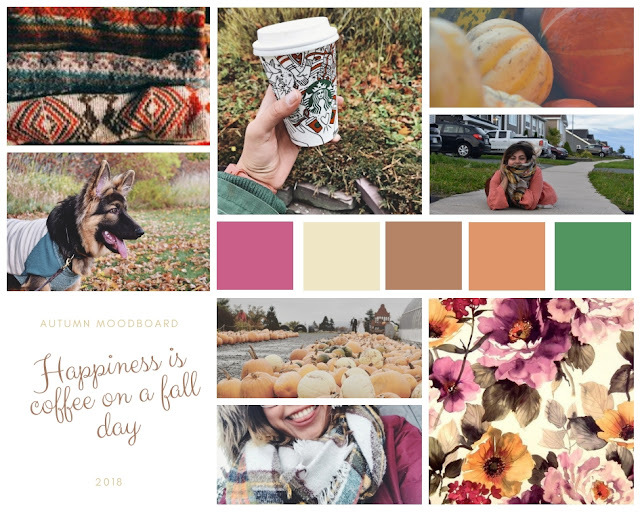 I want to welcome the fall season with a mood-board ! A board showcasing a couple of my photos from last fall, those being Oliver, my hand and the Starbucks Pumpkin Spice Latte we can assume was the beverage of choice that cold morning, the gourds and the pumpkin patch. I have added five colors that represent my feelings for the upcoming season and the colors that I want to be wearing to make the colder months a bit brighter and warmer. I love the fuzzy textures of sweaters, cardigans, jumpers that will be worn nonstop in the upcoming months. The fallen leaves you can find everywhere throughout the last months of the year give the world a new texture, the crunchy sound they make when walking, the crumble and folded look they get, makes for the perfect cold day. The floral pattern in the bottom right serves as a reminder that life is a cycle and that even though plants are slowly dying we are getting the beauty of the winter and in just a few months after we get to experience the magic of Earth's re-birth in the Spring Season. I guess I am just trying to say :keep a smile on your face during the colder months of the year and life would be good. As for the quote we can all agree that a nice hot beverage in a cold day cures anyone's soul.